If you’re thinking, wait a minute… D Legends Bar .. famous for food.. and Pork dishes.. doesn’t ring a bell. Well, that was us, just minutes before we stepped into this neighborhood pub, in TTDI. Sometimes, surprises pop up when you least expect them and in the strangest of places, but we soon found out that this unassuming pub, has an excellent lady Chef, who serves the most amazing pork ribs, pork burgers, pork pizza and my favourite.. pork bread (roti babi). 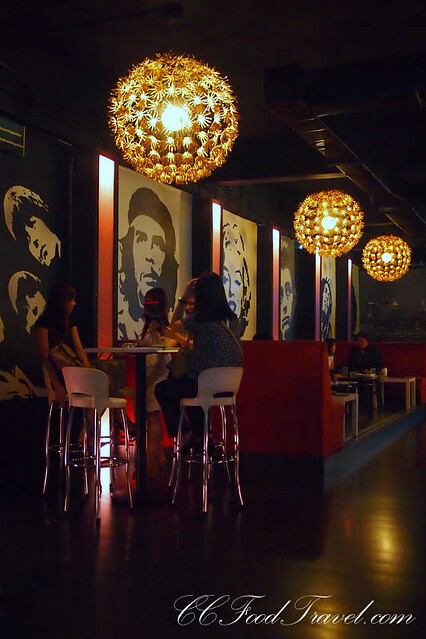 We walk into a well ventilated bar, and order our drinks. Guinness for me, and Kilkenny for the man. Soon the food arrives and it’s time to eat. 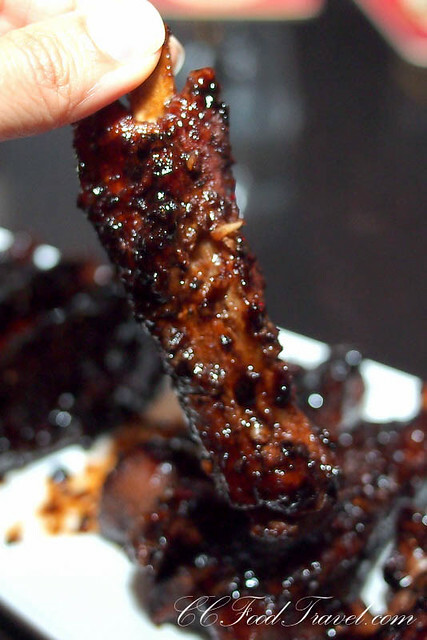 These juicy slow cooked pork ribs, tossed in sweet peppery BBQ sauce are just succulent shards of moist meat, that literally hang on the bone. 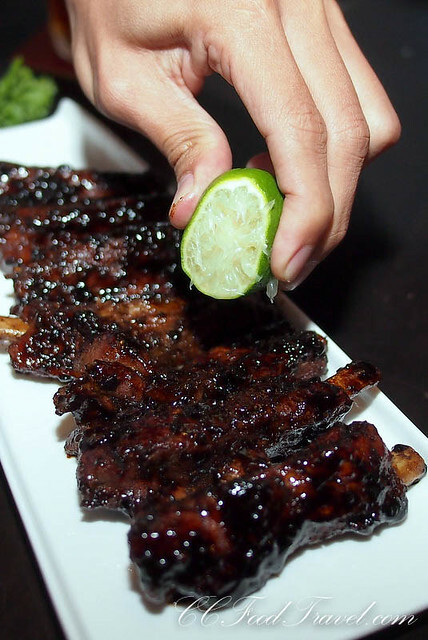 The potent ends of perfectly seasoned caramelized meat, baptized in a generous amount of lime juice makes it one of the best ribs in town. We appreciated the fact that the seasoning was more like a gentle splash of barbecue sauce, rather than drowning in sickly sweet goo. A perfect dish. Can’t ask for more. And as if to defy being stereotyped as just a meat or pork joint, the chef produces a gorgeous platter of canapés of Scottish Smoked Salmon. 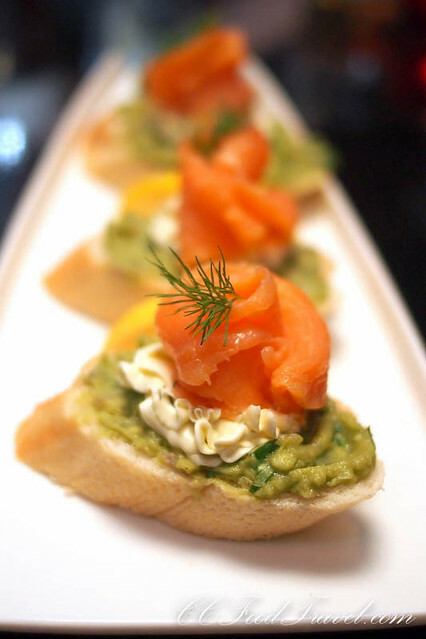 Lush, thick cuts of salmon served with an equally lush guacamole and dill cream cheese sauce. Our only complaint was the French bread was not toasted. Would have been much better crispy. The food tastes fresh, and low in sodium.. I find myself shaking my head in bewilderment, and wondering, 1. how had I not known of this place and its amazing food sooner and 2. how had I not known of this place and its amazing food sooner! Never expected this of a bar. Gobsmacked. But there were more surprises to come. Roti babi. 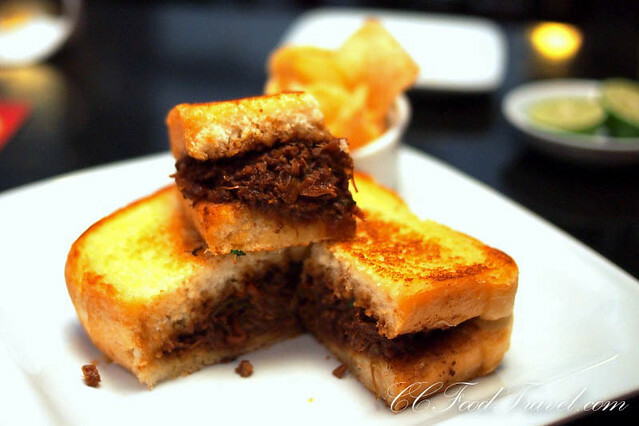 There’s no other way to describe this dish than pulled pork cooked with crab meat, onions, chinese sausage, slapped between two slices of toast and deep fried in egg. How awesome is this dish, and that they serve it at D Legends, is just mind boggling. Goes terrific with my Guinness I tell ya. 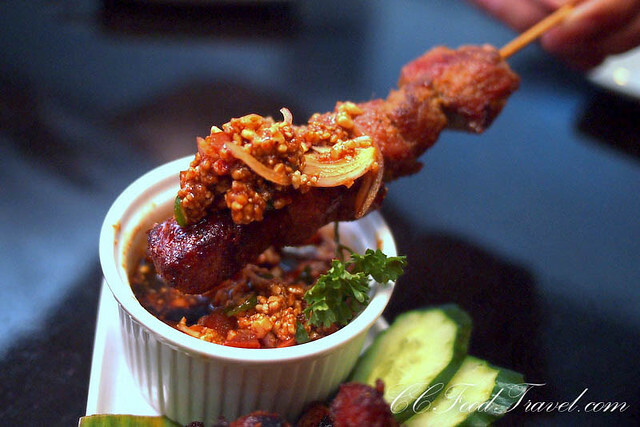 Another must have here is the Pork Satay. Cumi says the meat can be and should be tastier, but I beg to differ. I say the secret is in the satay sauce. This version really suits my tastebuds because it is satay, minus the sticky, overly sweet marinade and minus the sickly-sweet peanut sauce as well. The meat comes just as chucks of evenly sized, lightly seasoned pork meat, and that’s probably why some might call it bland. The sauce is the most wicked stuff I have come across in a long time. Fresh peanuts, diced tomatoes, lime, and the clincher – chili padi, in a super light, tangy sauce. There’s no trace of sweetness in it but the peanuts, and tomatoes really carry the flavor. Add a squeeze of lime to the meat, and this heightens the experience even more. Definitely a must order if you ask me. Then more porky goodness rain down on our table. A pork pizza with all manner of bacon, pork sausage and minced pork slapped onto it. They are really generous with the toppings. 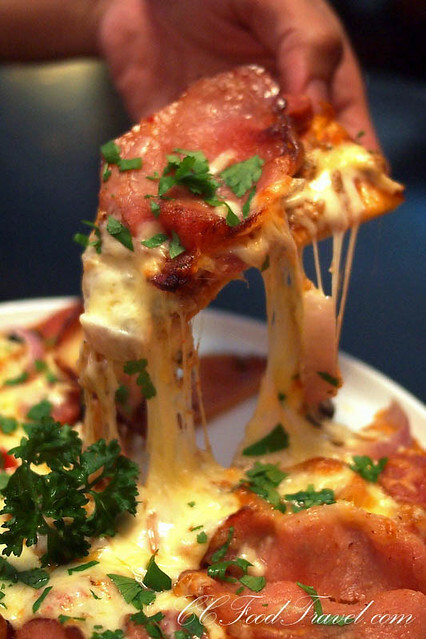 Our only complaint – we would have preferred thin crusted pizza and also more tomato sauce as a base. Finally, the not-to-be-messed-with, pork burger. Not massive, but solid enough to have you groaning in complete surrender. 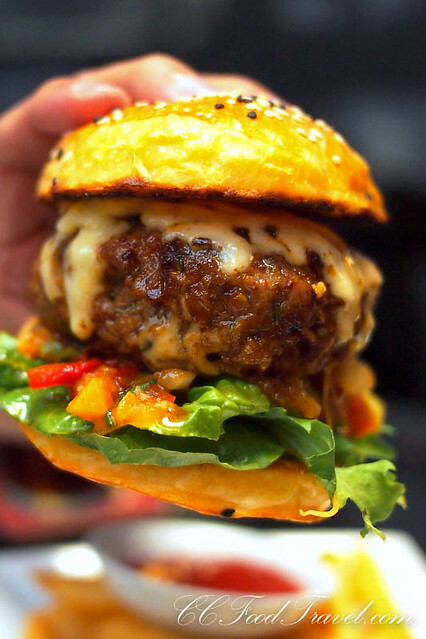 A rather succulent chilli pork burger patty, gooey mozzarella cheese, nice burger buns that hold their shape, served with thick cut fries that were fried to perfection (not greasy, just crispy) concluded this astonishingly memorable dinner. And if you think this bar does not have interesting desserts, think again. 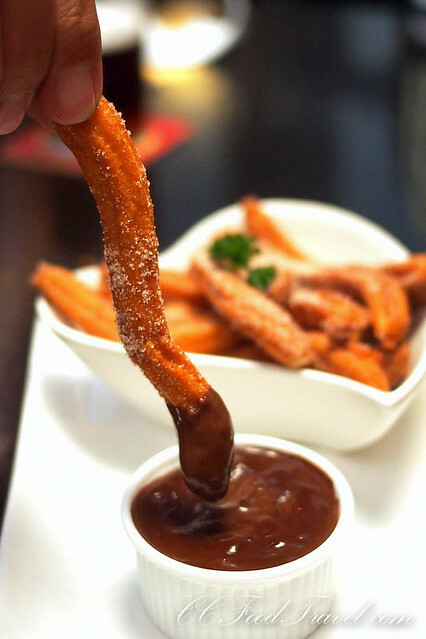 Here’s the Churros – deep fried Spanish doughnuts decadently powdered in cinnamon sugar, for dipped into a rich, hot chocolate sauce. Super yummy. Next articleCrazy about Loke Yun Ampang’s Chicken Rice! Love your first photo Umei! OMG ciki! I’m not really a burger person but that burger sure looks like something that I can manage along with that wonderful pizza. I loooooooove your photos babe! Woohoo! Thank u thank u! Like I said, please come visit us.. show u around ! Love your burger shot. You’re the owner?